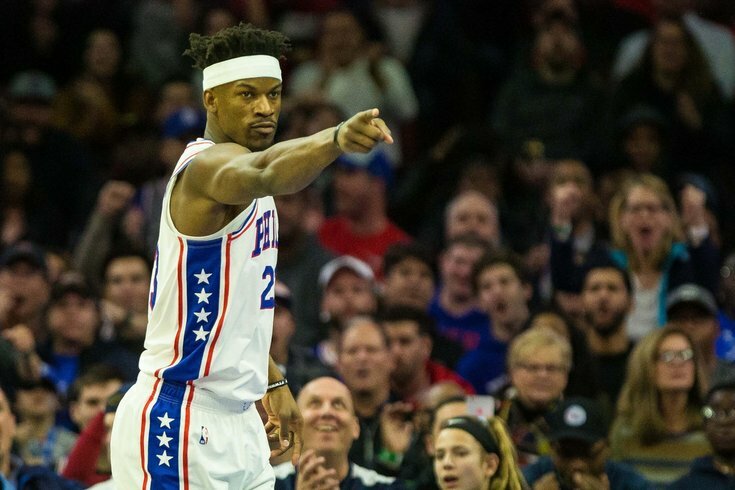 Philadelphia 76ers guard Jimmy Butler (23) reacts to his score against the Memphis Grizzlies during the first quarter at Wells Fargo Center. The Headband Bros. is the latest and greatest club in Philadelphia. Just ask any of the teammates of Ben Simmons and Jimmy Butler, because they are apparently on the outside looking in at this thing, too. NBA Trade Rumors: Can Sixers afford to turn down first-round pick for T.J. McConnell? After Sunday's win against the Memphis Grizzlies, Butler revealed the defensive intensity that has defined the pairing on the wing has a little extra juice to it. Simmons and Butler make some friendly wagers — they won't say for what or how much, but use your imagination — based on different benchmarks within a game. With steals the point of emphasis Sunday, Simmons came away victorious. It all seems a little confusing to the rest of the guys, including one of the players Butler has talked to the most. "Why the headbands?" Redick asked the media at practice on Tuesday. "How do the headbands go with the bet? I'm asking, [because] apparently they do. I don't know why you have to wear the headbands to make the bet to make steals and blocks. It's all a little far-fetched for me...they're a great fashion choice." The Sixers are undefeated in the Headband Brothers era, and their toughest test yet will come on Wednesday night against the Toronto Raptors. We'll have a more serious discussion of the matchup tomorrow, but for now, here are the rules you need to know if you want to be a part of this exclusive group. This is a point of some debate. Butler says it's Ben's call to wear headbands or not, though Simmons said that before the game against Washington, it was about a simple dynamic: if you wear one, I wear one. Butler did not agree with this framing. Since Simmons wore them in practices and warmups first, we have to consider that as the basis for the whole thing until proven otherwise. Citation: JJ Redick's quote up top. "We don't know just yet," Butler said when asked about what the bet will be for the Toronto game. "I'll talk to my guy on the plane and see what he has in mind. "It's just when you wear a headband, you got to do something a little extra special," said Butler. "So, it's his call, Ben's the one who calls if we wear headbands or not. That's on him." Serena Winters, NBC Sports: So if JJ wore one, then he could be a part of it? Butler: JJ knows he can not wear a headband. There is only one method to joining the club if you are not named Ben Simmons or Jimmy Butler. "You got to email me or Ben between 10:05 A.M. and 10:07 A.M," said Butler. "We may answer, we may not answer. If we don't answer, that means hell no." It is not clear at the time of publishing whether or not this applies to all days or just game days. A Sixers spokesperson declined comment on the matter*. *A Sixers spokesperson was not contacted about this matter.